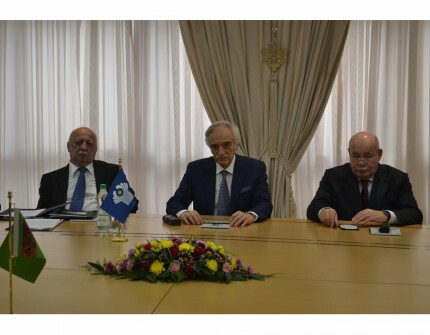 On January 28, 2019, a meeting was held at the Ministry of Foreign Affairs of Turkmenistan with the delegation headed by Polad Bulbuloglu, Chairman of the Board of the Interstate Humanitarian Cooperation Foundation (IHCF) of the Commonwealth of Independent States (CIS), who arrived in Ashgabat on a working visit. During the meeting, it was noted about the close cooperation of Turkmenistan with the Commonwealth of Independent States. It was also mentioned about the active participation of our country in the activities of events held within this organization. Afterwards, the sides discussed issues related to the holding of the XIV Forum of creative and scientific intelligentsia of the member states of the Commonwealth of Independent States at the highest level, which is planned to be held in Turkmenistan in May 2019. In addition, the sides noted the importance and effectiveness of the XIV Forum of creative and scientific intelligentsia of the member states of the Commonwealth of Independent States in Turkmenistan.